This post is based on a brilliant piece of research undertaken in 2010 by Pete Smith for English Heritage, presumably as part of The Car Project. The Motor Car and the Country House is a great read, and I would recommend saving or printing the file for your own records – even if cars are not ‘your thing’! Until the end of the nineteenth century, moving on foot or by horse was the norm. Within a very short space of time, automobile transport changed everything. Today, travelling to the country house is so simple in the car, and we may even pity the odd member of staff who makes the walk from the main gate to work. Country living is even synonymous with certain types of vehicle – the Land Rover and the Range Rover. And who hasn’t visited a British country house without stumbling through some classic car show? What follows is an overview of the research paper (images from the paper have not been included, as these are author copyright of Pete Smith 2010). Preparing for the 1000 Mile Trial, possibly at Welbeck Park, Nottinghamshire, 1900 (Science and Society Picture Library). The country house’s relationship with the motor car began in the final decade of the nineteenth century. Smith offers some useful facts and figures here: car ownership numbered less than 10 in 1895 but had grown to over 16,000 registered cars by 1906 and over 150,000 by 1912 (p. 1). In this time, car ownership had therefore developed from a pleasurable pastime to a fairly reliable means of regular transport. A neighbourly visit could be rather more impromptu and did not require advance ‘booking’ of the head groom, and attending to matters of the estate became increasingly efficient. Strikingly, the early models were constructed by coach makers and preserved ancient coaching names like ‘Phaeton’ or simply the ‘horseless carriage’ and according to The Autocar of 1 June 1901 cars were in ‘brisk demand because of their elegance, ease of handling and reasonable prices’. I worked this out – not very mathematically – but an early US model would cost about $750, which in the exchange rates of 1900 would be about £150. The spending power of £150 in Britain in 1900 is the equivalent of about £8,500 in today’s money. That would buy a nice runaround these days but would get you about 5 horses in 1900. … the Lincolnshire Automobile Club had a very pleasant run on Saturday, July 5th, on the invitation of Mr. C. Godson, a member of the club … The day was a perfect one for motoring, and the roads were in pretty good condition, although there was plenty of dust. 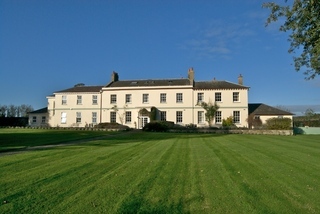 A long halt was made at Asgarby Hall [Heckington, near Sleaford], where Mr. Godson entertained the members to tea under the shade of the fine old trees on the lawn in front of the house. the motor car was the Hon Charles Stewart Rolls (1877-1910) the third son of John Alan Rolls, who was created 1st Baron Llangattock in 1892 (p. 13). Whilst at Cambridge, Rolls was introduced to motoring through Sir David Salomons. He soon had his own car imported, a 3.75 horsepower Peugeot, at a cost of £225 (a modern car will have up to 100 horsepower and beyond). 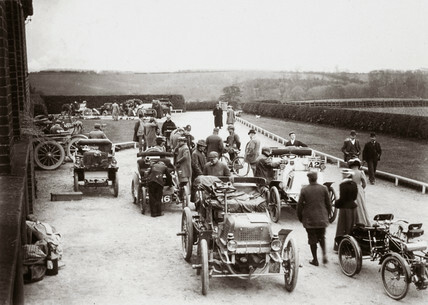 Rolls became an active member of several motoring clubs and organised a meet of the Automobile Club at his father’s country seat, The Hendre in Monmouthshire, in October 1900. By the end of the decade, and with the financial help of his father, Rolls had co-founded with Sir Frederick Henry Royce the Rolls-Royce Company including a new purpose-built factory in Derby. His fascination with new technology eventually took him to his death whilst participating in an aviation tournament in Bournemouth in 1910. Yet, as Smith states, Rolls had made ‘an incalculable contribution to the promotion of motoring in Britain’ and it would be the Rolls-Royce car which, more than any other, would find themselves parked outside the country houses of England in the years ahead (p. 14). The architectural impact of motoring was not a sudden or glorious one, and Smith pays particular attention to this in his research. Due to the type of car ownership in this early period, relatively few country house owners had purpose-built motor houses. Before the days of car dealerships and garages, the early motor car required daily maintenance which had to be provided on site. New country houses were designed with accommodation for the motor car like at Broomhill (Salomons Museum), Kent, and at Rosenau House, Buckinghamshire – both motor houses dated c.1902. But older establishments had to adapt and in this instance the ever more redundant stables and coach house became the most obvious alternative. For some country house owners, a new road layout or resurfacing of an existing one to the house was also seen as an essential part of the development into motoring. Rows of garages would be needed for housing the vehicles, and extra space was needed for a workshop and inspection pit. Add to this the living quarters of the chauffeur and an entirely new country house department evolved. house was seen as functional, and its lower status was reflected in its architectural proportions compared with existing stable blocks which still retained elements of grandeur. A more general view was reflected in Country Life magazine which was happy to include discussion on the motor car but only amongst its arts and fashion section, and rarely with a good photograph. After the first world war, the motor car became a necessary component of the country house party and the ‘bright young things’ lifestyle. It is difficult to imagine all those jazz-inspired characters flitting from one party to the next by horse and carriage. The motor car enabled the hasty visitor to arrive on time, but leave early – and probably rather discreetly as they moved onto the next house party. This mode of transport also added a degree of sprightliness to an afternoon of tennis, or a breezy picnic. The growing distances to which a car could cover meant that far away neighbours, friends, events and places of interest were visited in greater frequency (p. 20). For the country house and the estate the motor car had even better impact since it meant official duties could be carried out with efficiency. The estate steward may have even been offered use of a motor vehicle in his own duties visiting tenants and inspecting crops and game (p. 20). There was suddenly a cleaner, more reliable way of moving around the estate. Here, Smith makes use of some particularly funny photos from magazines The Car Illustrated and The Motor which suggest that a decent track was not always needed and many owners were happy to see their cars used in more traditional sporting activities! Throughout the twentieth century, the relationship between motor car and country house developed into three main threads; sport, leisure and of course, necessity. The country house became the venue for motoring club meetings where those who could afford one might discuss horse power, bodywork, distance and speed as well as comfort. The car also aided the development of existing sports like golf and cricket enabling shorter journey times over greater distances. Crucially, the car had its own sports – races, rallies and hill climbs. Donington Park (see above) even made itself the home of motorsports in the 1930s with motorcycle races; a move which later kept the house safe from destruction. A combination of these factors together with its growing reliability in getting from ‘A to B’ meant that the motor car was in fact a decisive tool in saving many a country house from demolition or neglect in post-war Britain. Some are the settings for golf clubs, others are spa hotels and places of retreat. Some are accessible to the general motorist whilst some simply remain working estates. All of these would be impossible without a determined driver and their car.